The Summer Grilling Celebration at TSRI continues with this amazingly flavorful Fully Loaded Tex-Mex Turkey Burger Slider. But first, we have some exciting news to share with you. We are absolutely delighted to have just started writing for allParenting.com from the publishers of SheKnows . It is a fun and upbeat site that focuses more on the parents than the kiddos. We will have featured articles 4 times this month!!! We will share with you each time we have a featured article so you can some check it out. We look forward to seeing you there! Back to the business at hand, this is an absolutely delicious and simple burger that will be a huge hit at your barbecue this summer. 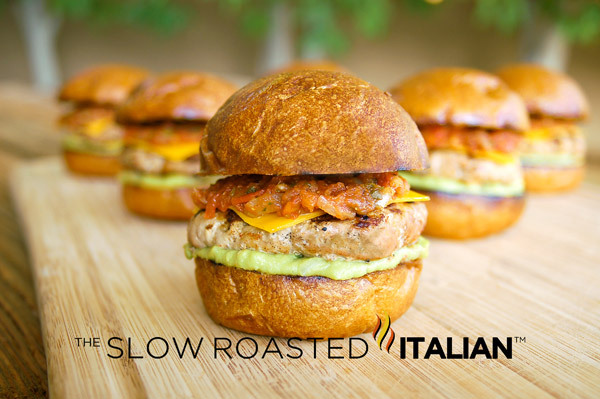 A celebration of summer with a flavorful seasoned lean turkey burger slider as the star. With fresh guacamole and a vegetable packed salsa, it is almost health food. Well that is what I told myself as I bit into the 2nd mouthwatering juicy slider. Crunchy, creamy, hearty and flavorful a burger so fantastic you can't help but eat 2, or 3.... I won't tell if you don't. But, you have to try this!!! We are calling on YOU our foodie friends to spread some foodie ❤ ❤ ❤ and come visit us over at allParenting.com. Read the rest of the article and get the recipe featured on allParenting.com.